Preheat your oven to 400°F. In an oven-safe skillet with high sides, add the oil and preheat it over medium-high heat. Wrap a slice of prosciutto around each piece of chicken and secure it with a toothpick. Add each piece of wrapped chicken to the hot skillet (top-side down) and cook for one minute. Flip each piece and season the tops with the granulated garlic and Italian seasoning; sear about a minute on each side. 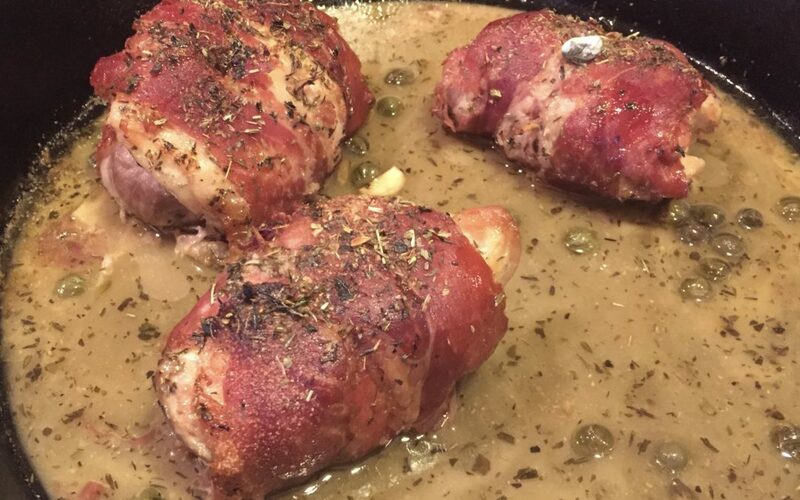 Add the wine, stock, butter, capers, lemon juice and garlic to the pan then pop the whole thing into the oven and roast for about 25 minutes or until the chicken is fully cooked through and the sauce has thickened and reduced by half. Scatter parsley over the top and serve.